This is a guest post written and filmed by Barbara Moore. When I come back in another life, I want to come back as a Hummingbird. Well, that’s if I did believe that was possible. I mean, what could be better than to look like a beautiful petite fairy and sip sugar all day at feeders or beautiful flowers! Not to mention zipping around in elusive bird flight. Anyway, I have had a fascination with Hummingbirds since seeing my very first one. With that fascination, I have become a faithful feeder and watcher, never tiring of their fascinating behavior. Watching has naturally led to photography and I have many hummingbird photos and am always trying for one more. I have never been able to get a picture of one of the most interesting things I have observed. Sometimes a hummingbird will fly in a downward arc, then turn and repeat the arc in the other direction and continue doing that for a dozen or more times in the same path, as if they were pendulum on a string. Experts are divided on why they do that, but since it’s only the males and in the Spring, it is likely either a territorial or a mating behavior. Shortly after we moved to our new house which backs up to a wooded area, I hung out my hummingbird feeder. After a few weeks I started to experience an odd phenomenon; every morning the hummingbird feeder was totally empty even though I had just filled it. As I wasn’t seeing more than a few hummingbird during the day, I decided to investigate. One morning I happened to get up before sunup and just happened to look out the window. Ah ha! I found my thief. There was a good sized raccoon sitting on the deck rail where he could stand on his back legs, reach the hummingbird feeder and guzzle to his heart’s content. I tried to get a picture of that but there just wasn’t enough light and as soon as I opened the door he took off like a rocket! 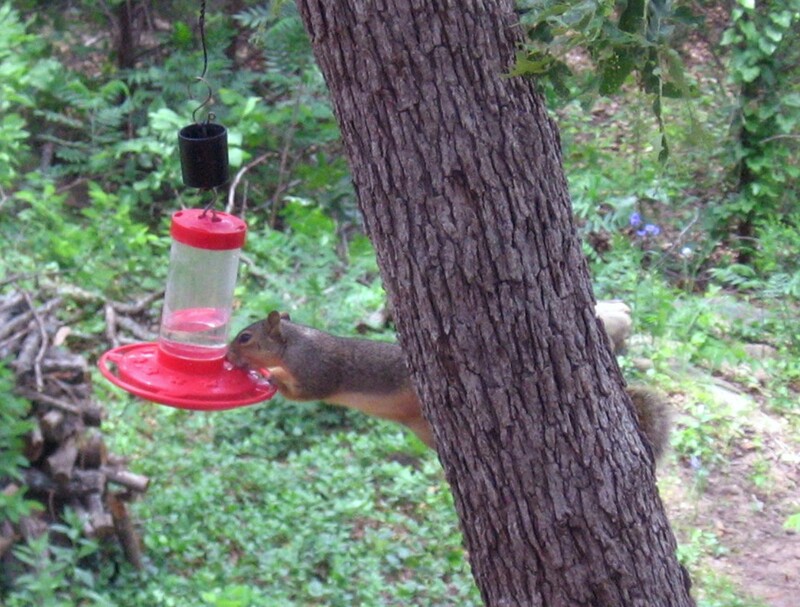 I have also caught squirrels hanging upside down and out from the tree, as this one, sipping from the feeders. Needless to say I came up with a way to hang my feeders away from rails and branches. This Fall we had an exciting hummingbird event; about 15 hummingbirds came to our feeder all at the same time. We have lived at the same location for five years and never had this happen. It was kind of strange as we have had maybe one male who occasionally would allow a female a brief visit to the feeder all summer long. Then this happened all in one day. For next several days there were many hummingbirds that came to the feeder, but not 15 all at one once. It was very exciting to be out on the deck with them as they were much less skittish. The sound is pretty amazing too. This entry was posted on Saturday, January 12th, 2013 at 1:46 pm	and is filed under Education. You can follow any responses to this entry through the RSS 2.0 feed. You can leave a response, or trackback from your own site.